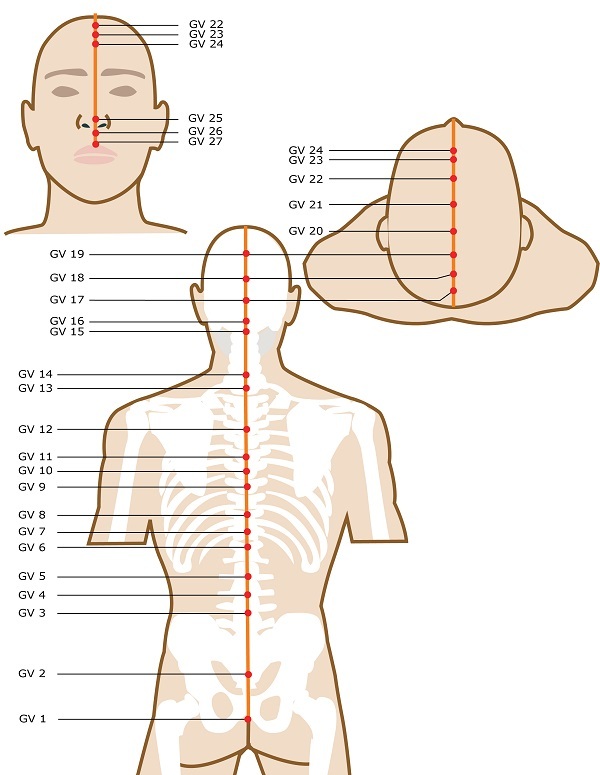 What acupuncture points are located on the head, neck, and face? 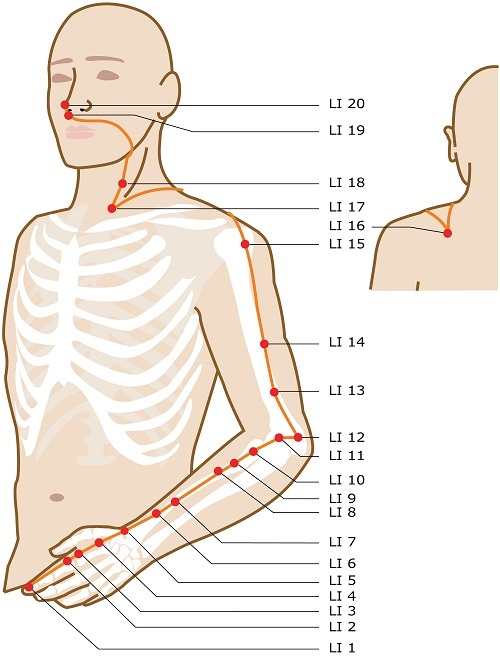 On this page I'll show you images from the acupuncture points guide of every meridian that contains acupuncture points on the head, neck, and face. There are six primary meridians that contain points on the head, neck, and face. The two major energy vessels also contain some points on the head as well. Also, five out of the six extraordinary meridians contain points on the head, neck, or face as well. That gives us a total of ​13 different energy pathways that contain acupuncture points above your shoulders. Let's take a look at these energy meridians below. Our first primary meridian contains a complicated zigzag pattern of points moving up the back of the shoulder, along the side of the neck and onto the face. The last point ends right next to the ear. Next up we have the large intestine meridian. The large intestine meridian has a few points adjacent to the nose. Most of our acupuncture meridian maps only show one side of the meridian in question (left or right). However, the points next to the nose are shown on both sides in this image. This is because every meridian has points in symmetrical, parallel locations on both sides of the body. Our image artist must have taken the liberty to show the points on both sides of the nose in this image, just for fun. Next up we have one of the coolest sounding meridians, the triple energizer. You may have noticed that the triple energizer isn't named after a major vital organ like most of the other meridians. That's because this meridian is related to the function of bodily fluids, including lymph node fluids, that flow in between the major organs, instead of being related to a specific organ. Our next energy pathway is the stomach meridian. The stomach meridian is unique in that it's the only primary meridian that has a single pathway that splits into two paths that don't come back together. The only other meridian that has a splitting pathway is the bladder meridian, which we'll be looking at shortly. ​But first, we'll take a look at our next friend, the gallbladder meridian. The gallbladder is often forgotten about in talks of our internal organs. Probably because it's one of the few that you can completely remove from the body and still live to tell about it. Despite not being famous, this meridian has more acupuncture points on the head than any of the other meridians in the body. You can see just how complex the head's energy pathway is for this meridian. There are points all over the side and top of the head, and a few nearly reaching the back of the head. 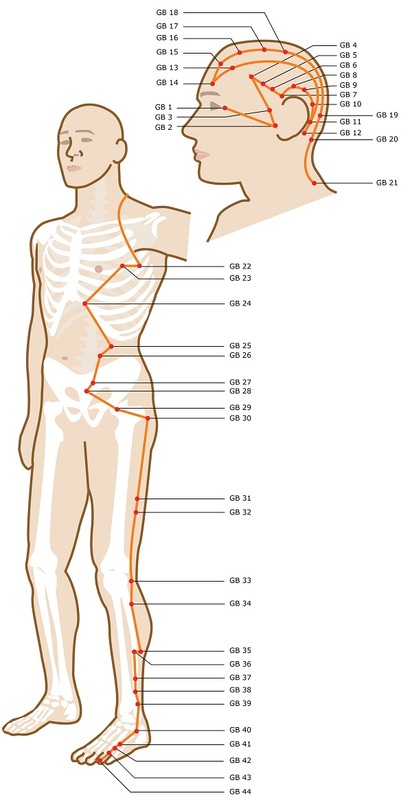 Next we'll look at the bladder meridian mentioned earlier, which also has acupuncture points all over the head. The bladder meridian is perhaps the most complex meridian of the body, since it has two very long branching pathways that go down the entire body's length. ​But our concern on this page is with the bladder meridian's head points, which you can see come up the back of the head and over the top of it and come to a stop at the inside of the eyes. ​That's the last primary meridian that contains energy points on the head. But we still have the two major energy vessels as well. First up the is conception vessel. There's not much to this meridian pathway. It's just a straight line down the front of the body, from right under the bottom lip down to the CV 1 point which is located under the crotch (not pictured on this image). The second major energy vessel is the governing vessel. Like the conception vessel, the governing vessel is just a straight line down the body. Except this energy pathway goes up and around the face and down the back instead of the front. You can see ​points from this energy vessel are found on the front, top, and back of the head. That's the last of the primary meridians and major energy vessels that contain acupuncture points on the head, neck, or face. But next we're going to list the minor extraordinary meridians that contain points here as well. No minor extraordinary vessel has it's own acupuncture points. They are only pathways of energy that flow between and around points from the other meridians. You can see that this extraordinary vessel has just one point located on the face on the inside of the eyes. It also has a substantial energy pathway that surrounds the mouth and continues down the body to other points. More of the same for this meridian. You can see the uppermost point is located on the front of the neck, with another point just below it around the middle of the collarbone area. Just one point on the face for this very minimalist energy pathway. 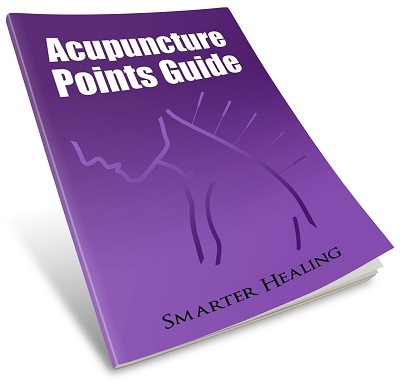 There's plenty of acupuncture points on the head found in the yang linking vessel shown here. Most of them are from the gallbladder meridian, with a few others added in as well. And finally, we have our meridian image coming up next. There's a few points on the front of the face that lie along this minor extraordinary energy vessel, and one lonely point on the back of the head. That's all folks! 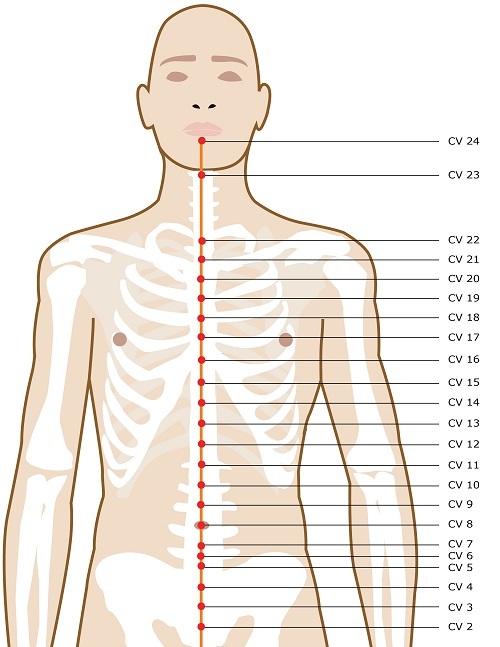 That's every acupuncture point found on the head, neck, and face.